← This Is My Body, Not Yours. 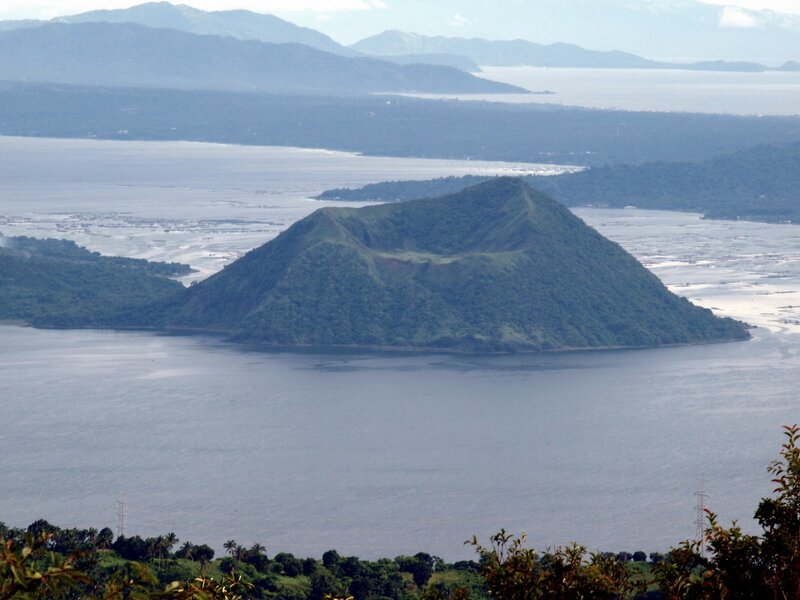 After visiting a friend’s grave site, we decided to head over to Tagaytay, where Antonio’s Grill is located overlooking the Taal Volcano, which is in the middle of Taal Lake. It was a good time for a leisurely lunch. Our timing could not have been better. I noticed the air slowly getting heavier through the morning and the clouds started to move in slowly to cover the sun. Just as we trooped into the restaurant, we heard the gentle tapping on the windows. It had started to rain. First came the sinigang na hipon (Prawns in tamarind soup). This can be spiced up a little with a chili pepper included during the quick simmer. It is served with leafy greens usually, some tomatoes, eggplant, radish, and any other seasonal veggies like kangkong (a cross between spinach and kale) or cabbage. Then came a dish the locals called “gising-gising.” The term literally means, “to wake up.” The dish is composed of kangkong stems cooked with ground meat (chicken, pork, fish) and simmered in coconut milk and some chili peppers. The taste, flavors along with the kick from the chilis will surely wake anyone up, they say. And true enough, the dish delivered! I had asked for pinakbet, a vegetable dish not too different from the French ratatouille or the Spanish Escalivada (most countries have their version of vegetable stews). Pinakbet can have other vegetables but they tend to have at least the following: eggplant, ampalaya (bitter melon), okra, tomatoes, beans, sigarilyas (winged beans), squash, and other types of beans and pods that are in season. It is sautéed in garlic, onions, and a little ginger. It is salted with shrimp paste (bagoong) and served as is or with pieces of lechon, or other types of meat for contrast. I can eat this everyday and not tire of it. My friends had ordered Kare-Kare, a stew made with ox tails, tripe, and other animal parts with enough cartilage to thicken the sauce. The sauce is further thickened with ground roasted peanuts and flavored and colored with atchuete (annatto seeds). Seasonal vegetables are added at the end of cooking. It is served with good quality shrimp paste(bagoong) on the side. I was particularly wowed at the size and beauty of the grilled bangus (milk fish) which was stuffed with tomatoes and onions. The fish was quite fresh, tender, and even slightly sweet. Not fishy at all! At the end of the meal, we decided to behave ourselves. So we ordered one dessert to share. Of course it had to be the turon. These are classically ripe bananas, usually saba, plantain, or a similar variety of sweet tangy and meaty), that are wrapped in paper-thin rice paper, quickly fried, patted with paper napkins and then doused with caramel sauce. Yum! I was tempted to ask for ice cream on the side but, we did say we’d behave ourselves. It was a hearty meal with great company (as always!) in a scenic location. What an afternoon! This entry was posted in Banana Turon, Filipino Food, friends, Gising-Gising, Grilled Stuffed Bangus, Kare-Kare, Pinkabet, Sinigang, Taal Volcano, Tagaytay, Travel and tagged Banana Turon, Bangus, Bitter melon, Friends, Gising-Gising, Kare-Kare, Pinakbet, postaweek 2013, Sinigang, Taal Lake, Taal Volcano, Tagaytay, Travel. Bookmark the permalink. The foods divine! I miss going here last Summer. Perhaps in 2014. Thanks for sharing a beautiful time with family. Delicious foods and a spectacular view! I’m sure great company too. This is not Antonio’s, which is the ancestral looking house turned thre- star restaurant deep into a residential neighborhood. This is the white summer-house looking structure overlooking Taal volcano that’s more informal. A different kind of fun for each location by the same owners. Ok, didn’t know that. Lots of new interesting places cropping up there. We went to the ancestral looking house which my husband really loved. Both are fun places. I did not know about the white informal dining room overlooking the volcano. My friends told me about it. But the ancestral home, especially if you request for the seat by the large windows or on the terrace, is especially beautiful at sunset. Looks delish and the view is spectacular! Thanks for sharing! Great food photos! That diffuse light really made it. And not to mention it looks super yummy! So many different dishes. It looks to me like a feast. Thanks for sharing, Mary-Ann. I wouldn’t mind trying the grilled bangus for you say it didn’t taste fishy. This is the kind of fish I very much like. What a feast, fantastic but even the most simple food is wonderful with the right company to share it.